Looking for the best driving school on Mercer Island? You have several choices, but SWERVE Driving School is your best choice. 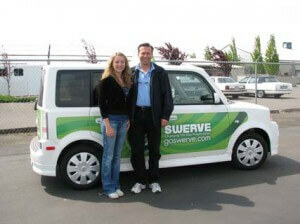 What makes SWERVE Driving school the best choice for drivers education on Mercer Island? SWERVE Driving School’s curriculum content and support materials are current and lively. Classroom material is organized so that it supports what teens are learning behind the wheel.SWERVE Driving School’s instructors teach Mercer Island students to be safe and responsible drivers in a fun and supportive environment. Are you ready to get your license and become a great driver? SWERVE Driving School is your best choice for driving school on Mercer Island or in a variety of Seattle area driving school locations. Simply enroll with SWERVE today by registering below or give us a call at (425) 881-6800. 1 WA State Road Test - Your Vehicle or no additional charge to use a Swerve Vehicle. Limited availability at Mercer Island; Klahanie and Woodinville also available. Register here for your WA State Knowledge test, then call the office to schedule a test time. The price is good for three attempts for the same person. Register here for your WA State Knowledge test and Road Test. After you click "sign up", choose the Knowledge and Road Test Combo button, enter your information, and a list of available Knowledge Test dates and times will pop up for you to choose. The price is good for three Knowledge Test attempts for the same person. Once you have passed the Knowledge Test, please call to schedule your Road Test. To use your vehicle we will need proof of insurance, current tabs, and a pre-test vehicle check to make sure systems are in proper working order. Please call with questions. We can provide you with a temporary permit to take the test if you do not have a WA permit or license from another country. The price is good for one Drive Test attempt. If you would like to use a Swerve vehicle for the Road Test for an additional $20 fee, please notify office staff when you call to schedule. *Knowledge Testing available at Klahanie and Woodinville locations only; Road Testing available at Klahanie, Woodinville, and a limited schedule at Mercer Island. 1 WA State Road Test using a Swerve Vehicle. We have assorted Toyotas and Nissans available for testing. You do not need your own insurance to use our cars. The WA State knowledge test must be passed before a Road Test can be provided. We can provide you with a temporary permit to take the test if you do not have a WA permit or license from another country. We have assorted Toyotas and Nissans. You do not need your own insurance to use our cars. You must have a license from another country or a WA permit to do the warm up. We cannot provide a temporary permit for warm ups. The warm up is intended for those who already know how to drive and are familiar with the rules of the road, but just want some time to relax and get comfortable. Testers will answer questions and practice any skills the customer wishes to work on during the warm up period. The same person who does the warm up will also administer the test itself. We schedule one hour total. The WA State knowledge test must be passed before a Road Test can be provided.